This is a subset of the graphics commands which are used to draw and manage SysCAD flowsheets. Note that SysCAD must be in the Edit mode (stopped) for most of these commands to be accessed. This will open the Insert Unit dialog box and is used to build a SysCAD flowsheet. Select the required unit model from the list on the left hand side of the dialog box. 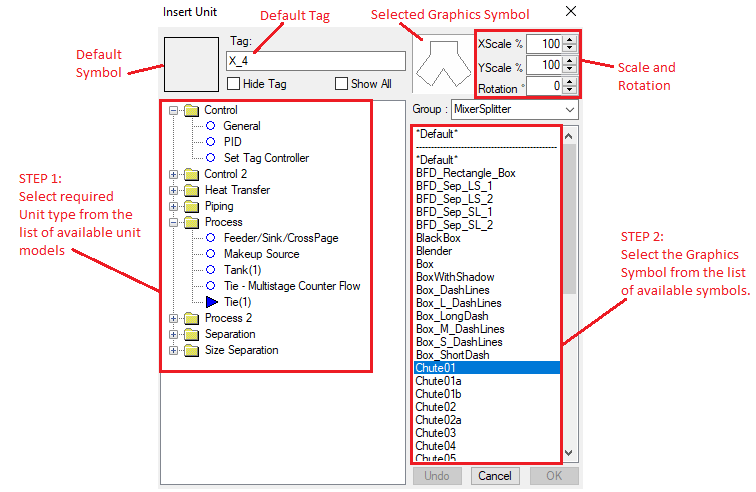 Select the required graphics symbol from the list on the right hand side of the dialog box. To insert the unit, left click once on the appropriate position in the Graphics Window with the left mouse button. The selected unit will be drawn on the Graphics Window. The mouse cursor will be displayed as the name of the model type being inserted onto the graphics page. holding Ctrl + Shift and left click again to alter its position on the flowsheet. In SysCAD 9.3, the user can move the newly inserted unit using the arrow keys. While the Insert Unit dialog box is open, user can repeat the above steps to insert more unit operations. The user may click on the Undo button to undo the last command (insert unit or fine tune position). Click the OK button once all required units have been inserted to add them to the flowsheet. You can remove all units inserted in an Insert session by selecting the Cancel button, or hitting the Esc button on the keyboard. You can also watch a short video at Basic Tutorial - Insert Units into a Flowsheet, which describes how to insert units to build a flowsheet from the Basic tutorial. The Left Hand list contains all unit model types available for use in the project. To display all unit model types available in the dlls which are loaded, enable the Show All option. This is only available in Build 138 or later. If the Include All Unit Models option has been enabled in the cfg file (refer to Model Selection), then all the unit model types are already displayed and this option will be greyed out. This list will default to last unit selected, or to a Feeder/Cross Page connector in a new project. The default graphics symbol of the selected unit will be displayed on the top left hand corner to clearly display the currently selected model type. The Right Hand list shows a list of the available graphic bitmaps for the chosen unit type. To access a FULL list of the graphic bitmaps choose *All* in the Group drop down list. 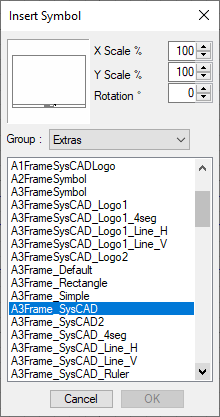 Users may save their own graphic symbols to the appropriate folder in \SysCAD92\BaseFilesUser\Symbols folder. See Graphics Database. Changing the unit's rotation or scale can modify the appearance of the unit. These options may be changed before the unit is inserted, or the user may change these later using the Scale/Rotate functionality. HINT: To mirror a graphics symbol along the x-axis or y-axis, type in a negative number in the relevant Scale box. The unit model's tag name is shown in the Tag field. The user may enter the required tag name when inserting the unit or they may change it at a later stage. The Hide Tag check box will show or hide the tag name when drawn on the Graphics Window. The Tag Annotation function can be used to display or hide the tag name after the unit is drawn. If the unit needs to be positioned precisely on the Graphics Window, when inserting the unit hold down the left mouse button and cross-hairs will appear to help you position the unit's graphics symbol. The coordinates of the cross-hairs are displayed in the bottom right hand corner of status bar and are updated as you move the cross-hairs. Release the mouse button to insert the unit. Insert the first unit and then select another unit from the list and insert it. If the same unit type is required, you may position each unit by clicking its position on the drawing, without re-selecting the unit type. Only click on the OK button when all units are inserted. The model type for a unit can be changed once it has been inserted - see Change Unit. The Graphics Symbol can also be changed after the unit has been inserted - see menu command Change Symbol. Select the Insert Link command. Click on the Source unit for the link. Note that the cursor will change to the Source pointer, , when the cursor is in the Graphics Window. You must choose a connection port IF a pop up box appears. The cursor will then change to the Destination pointer, . Click on the second unit operation. Choose the correct connection port, if required. The user may then accept the automatic link drawn by SysCAD, by clicking on the 'OK' or 'Next' button. The Options that govern the appearance of the automatic line drawn by SysCAD are discussed at Default Graphics for Insert Link. If the user wishes to draw their own link, then simply click with the mouse button on the first point of the link. The automatic line will be deleted and the user may continue to draw the line, as described at Graphics for Insert Link and Redraw Link. You can also watch a short video at Basic Tutorial - Insert Links, which describes how to connect units with links. Available connection ports for units are shown in black and unavailable connection ports are grey. The number enclosed in [ ] refers to the number of connections available for that port. A link can be redrawn later using the Redraw Link function. Change the Default Link Graphics Options method to 'None' if you do NOT want SysCAD to automatically draw a line. See Default Graphics for Insert Link. If you have selected the orthogonal line option, SysCAD will draw only horizontal or vertical straight lines. You can click on the binoculars or magnifying glass next to the tag to find or access the Source (SrcIO) or Destination (DstIO) unit. This command will open the Text dialog box. Move the mouse cursor onto the graphics window, noting that the cursor will now read POS. Click on the graphics window to place the text in the required position. The text is bottom left aligned. Once the new text is inserted, press Create Next to insert another string or Done to finish. If no text is entered in the New Text field, the word Text will be inserted. This dialog box is used for the Change Text function. To edit an existing Text string, press Select Next, then change the Text, Scale, Rotation or Width and press Apply. This command can be used to insert a graphical symbol which has no mathematical model behind it, i.e. "dumb" graphics (see Manipulating Graphics for information). One possible use of this is to insert a border onto a flowsheet. Choose the graphics group. For a list of all symbols, choose *All*. Choose the graphical symbol from the list. Insert the symbol onto the flowsheet with a SINGLE LEFT mouse click. In SysCAD 9.3, the user can move the newly inserted symbol using the arrow keys. You can remove all symbols inserted by selecting the Cancel button, or hitting the Esc button on the keyboard. Once all the graphic symbols have been inserted press OK. This command inserts a group of SysCAD models which has been saved using the Create Group command. After a group of models has been saved to the neutral database, it can be inserted into any projects that have access to the basebase. To insert a group, click on the graphics window and then select the Insert Group command. This will open the Insert Group dialog box. The model information is retrieved from a neutral database. In the Create Group section example, we have assigned the Group with Alumina:Digestion. When this is done, we have created a Group called Alumina, with a sub folder called Digestion. In practice, user can then save other flowsheets in the same manner, eg, Alumina:Washers etc. Find and replace tags - this is optional, but should be used if the copied group is to be inserted into the same project to avoid duplicate tag names. In the above example, we have asked to Add Suffix to all the tags. The Current Status line will display any duplicate tag errors if any. You will not be allowed to proceed if duplicate tag is found. In that case, press the reset button and start again. Once all the options have been specified and the current status displays Ready to insert at Dig Pt, move the mouse cursor over to the graphics window and LEFT click to insert. Once the models are inserted, press Done to close the dialog box.